This tutorial provides you with a foundation for working with Adobe Photoshop Elements printing settings. It is the sixth lesson in the Adobe Photoshop Elements 10 Digital Classroom book. If, when printing, you’re not getting the desired results, try changing your page and printer options. 1 Choose File > Print and click on the Page Setup button at the bottom of the window. The Page Setup dialog box lets you change settings for printing. 2 If you work on a Windows computer, when the Page Setup dialog box opens, press the Printer button and select a printer from the Name drop-down menu. To specify layout and paper options, press the Properties button. You can also press the Advanced button in the printer driver dialog box (if available) to set other printer options. Then press OK to close the dialog boxes. 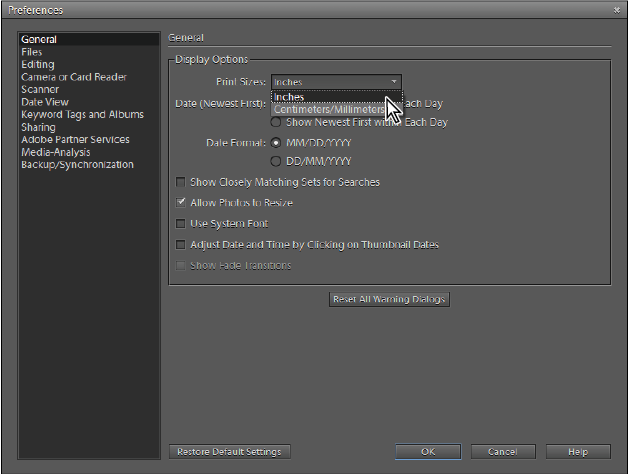 Select Page Attributes under the Settings section, and then select your intended printer under the format for section. You can choose the US Paper to specify the paper size that will be used when printing this job. The availability of the Advanced button and printer options depend on your printer, print drivers, and version of Windows. To access these on the Mac OS, go into your Settings panel. 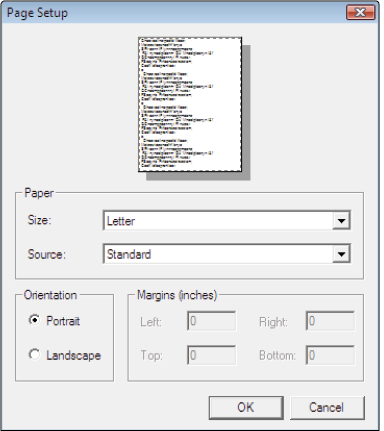 3 Back in the Page Setup dialog box, specify paper size, orientation, and other desired options, and then press OK.
You may also want to change the measurement setting that defines the sizes you can choose from when you print or crop a photo. 1 In the Organizer, choose Edit > Preferences > General (Windows) or Adobe Elements 9 Organizer > Preferences > General ... (Mac OS). 2 From the Print Sizes drop-down menu, choose either Inches or Centimeters/Millimeters, and then press OK.
Changing your measurement units helps to define sizes for printing and cropping. Backing up files is essential for protecting your valuable photo files. If your computer fails, files that have been backed up are safely stored on the destination volume of your choice, and can be restored into Photoshop Elements. Photoshop Elements enables you to open a Photoshop.com membership account and back up your photos to Photoshop.com servers. Once you enable backups, Photoshop Elements uploads the albums you specify to Photoshop.com. In Photoshop Elements 10, you can backup individual Albums or all photos not contained in an Album. Photoshop Elements also keeps the files on your computer synchronized with the files on Photoshop.com. Your albums on Photoshop.com are updated whenever you add, delete, or edit photos. It is possible to add, delete, or edit photos in Photoshop.com after backing up your albums. But you should remember that Photoshop Elements synchronizes albums backed up to Photoshop.com with the respective albums on your computer. Therefore, if you edit a photo on Photoshop.com, the corresponding photo on your computer is updated with those edits. By the same token, if you edit a photo on your computer, the backed-up photo on Photoshop.com is updated with those edits. Photoshop Elements also synchronizes your albums when you add tags to files, as well as add or delete photos. If you delete a photo from an album on your computer without deleting it from the catalog, the photo remains in your Photoshop.com account.